Just found out from the Bad Astronomer that astronomers have now discovered more than 500 exoplanets. I can remember when they found the first one and it seemed impossible they would ever find more. Now it is hard to keep track of them all – it has always been a side hobby of mine to try though. Here is a link for the best information on any of the exoplanets and the stars they circle – The Extrasolar Planets Encyclopedia. This site has been in place from the very beginning. I find it to have the most accurate information and is updated frequently to include new information on already discovered exoplanets. This brings me to an area of art that I also find fascinating – the people who draw artistic images of what these planets may look like. Several years ago I bought a book called The Grand Tour – A Traveler’s Guide to the Solar System by Ron Miller and William K. Hartmann. There are several images showing what the terrain might look like from the planet, especially one I like showing what the rings could look like from Saturn itself. A more appropriate book for this blog today is a book called Infinite Worlds – An Illustrated Voyage to Planets Beyond Our Sun by Ray Villard and Lynette R. Cook, which has many images of what worlds may be like around some of the exoplanets that have been discovered. This is another book I have always liked. If you are a painter or want to learn about space landscape perspective, there is a book that gets very high ratings when trying to create these type of pictures. It is called Space Art: How to Draw and Paint Planets, Moons, and Landscapes of Alien Worlds by Michael Carroll. There are also several 3D programs like e-On’s Vue software which appears to be for the serious creator or Bryce 7 or Terragen Classic can both be downloaded for free. 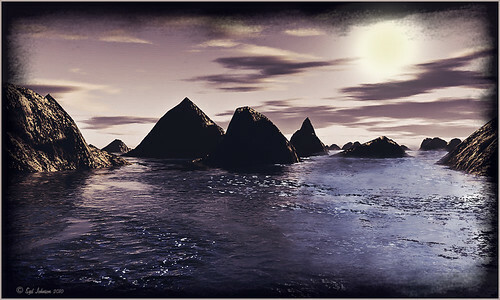 I played around with Terragen several years ago and had forgotten how much fun it is to be in charge of your own world. Here is an image I just created in the latest free version of Terragen. I was trying to get the effect of a water planet circling a sunlike star. I also tried my hand at creating a two moons as seen from a marslike planet. 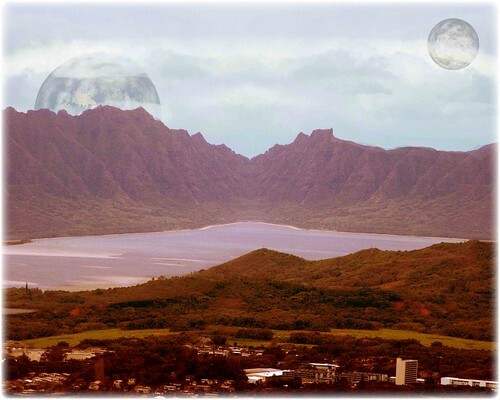 In this case I followed a tutorial done by Al Ward on the NAPP Website called “Postcards from Venus.” I used an image I had taken of Nuuana Pali Lookout on Oahu in Hawaii and used the Flaming Pear plug in called Lunar Cell to create the two moons. It turned out to be a lot of fun to create.